I mentioned below my belief that Alexander Huber is probably the best all-around climber in the history of the sport. 8a.nu reports that Adam Ondra has repeated Open Air, a route from over 10 years ago and confirmed at 9a+ (5.15a), taking 5 days to complete it. Typically 8c+ takes him a couple of tries. Om, a 1992 route, is the next on the list of Huber desperates to go. What is interesting about this is the extent to which the historical record is distorted by publicity and promotion. Alex climbed Open Air before the age of widespread video and internet information so he operated almost in a vacuum and the route was ignored despite the obvious difficulty of the moves. Sharma's efforts on Realization were extensively documented and the ascent was promoted extensively so in many people's minds that route was the first 5.15. Whether the other contenders such as Akira or Chilam-Balam are legit is still contested. (Thanks to Climbing Magazine for this link to an interview with Ondra about the climb. 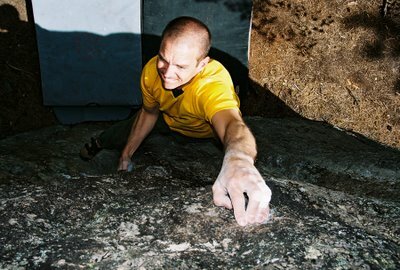 We must also consider broken holds... perhaps the climb is harder now than when Huber did it? not to mention... Huber's a communist, Ondra a socialist, and Sharma is a patriot. It's true, I saw it on FOX News. ... Fred playing on Akira a decade later to prove it goes and he did it. By legit I actually meant the grade. I don't doubt that they have been done. Isn't Chris a Buddhist? Yes, but there are doubts about whether Chilam-Balam was ever done. Dani has no doubts it was done. He has said something to the effect that he wished he could have found such an amazing line. Is this the dream job?